Get Those Hummingbird Feeders Up! 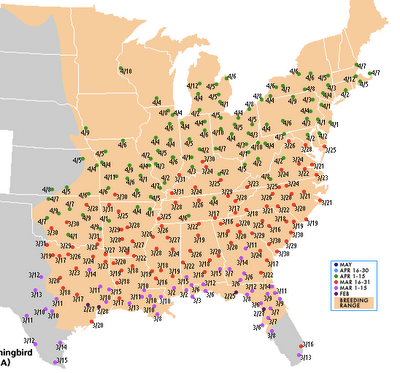 I posted this morning about the Chimney Swift migration updates available online and figured I'd mention the fact that you can track the Ruby-throated Hummingbird migration online next week some time. I checked the website to see how the hummer migration is coming and to my surprise they are trucking north at a rapid clip. Check out the most recent map! There are none in Minnesota yet but one right across the river in Wisconsin. It looks to be almost directly across the river from the nature center! I'm guessing what we're seeing here is hummingbirds using the St. Croix River as a flyway. Time to get those feeders out.